Applicable only on box8 mobile app and website. Please just follow the landing page for more details and to order today at Box8. Box8 is offering Buy 1 Get 1 Free on First Order by Using the code. Valid Only on Supreme Category of Products. Applicable only on Box8 mobile app & website. Valid across all outlets of Box8 in Mumbai, Pune, Bangalore & Gurgaon. Just Order your favorite food Now and save big on your food expenses! Yes, as informed in the description it is applicable on selective food orders. You can check with other deals for your desired food. Save on your food orders. GrabOn's Exclusive All Users Offer from Box8, Order food at Box8 and get 100% Cashback. Minimum order Of Rs 200 is required. Code can be redeemed only once by all users. This code is Valid across all locations of Box8. This is Valid across Mumbai, Bangalore, Pune & Gurgaon. This is Valid only on Box8 mobile app and website. Valid on all payment methods. Order now with Box8!! 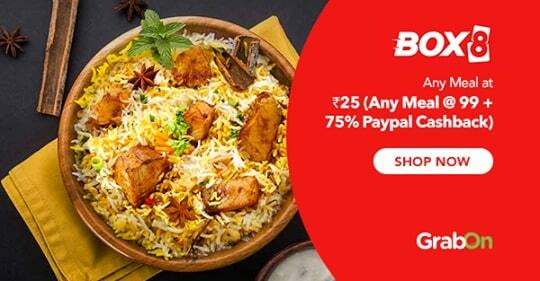 Box8 is Offering Flat 15% OFF On Food Orders by using the coupon code. This is not valid on Sides, Meal for 2, 8Pass, Drinks & Desserts. Valid only on online payments & Cash On Delivery. Applicable on All-in-1 Meal, Fusion Box, Sandwich, Wraps, Salads, Biryanis & Curries. This is Applicable only on box8 mobile app and website. Verified on 20 Apr 2019. Box8 is Offering Up to Rs 100 Cashback with Paytm UPI. Payment has to be made using Paytm UPI. This offer can be used with Other Box8 Offers also. Box8 is Offering 100% Up to Rs 300 Cashback with Paypal Wallet. Payment has to be made Using Paypal Wallet. Order Food at Box8 and Get 25% Off. This is applicable on minimum order value of Rs 248 or more before discount. This code can be redeemed by all users. This is Valid on all payment methods. Valid across all locations of Box8 in Mumbai, Bangalore, Pune & Gurugram. This is applicable only on Box8 mobile app and website. Box8 is Offering Flat 50% Off on Food Orders. This is valid only on New Users. Not Valid on Sides, Meal for 2, Party, Ice creams, Drinks & Desserts Categories. Box8 has Superb late Night Delivery till 1 AM Which they Promise 38 min or Free Delivery Guarantee. Valid on all payment methods. Just Please follow the landing page for more details. This is applicable on all payment methods. Please follow the landing page for more details. Box8 is offering Buy 1 Get 1 Free for all users by Using the code. This is Valid for All Users only. This is Valid only on Box8 mobile app & website. Verified on 20 Apr 2019. Locate yourself in Box8.in and order this Choco Lava Cake which is delicious and tempting in taste at just Rs 58 Only. Box8 is Offering Party Orders at Best Price. Work Hard, Eat Harder this Season and avail Unbelievable Offers on all Party Orders, Corporate Lunches, Team Outings and all other Events. No Box8 Discount Code is Required. Coupon/Offer Details: Verified on 20 Apr 2019. Box8 is Offering Best Food at Best Price. Box8 has more than 50+ outlets spread across Mumbai, Pune & Bangalore delivering 10000+ orders every day, Just Order Wraps, Sandwiches & Salads with a fusion of Indian & western flavors & have the most authentic, indigenous taste in Biryani & Curries at Best Price. Box8 Code is not Required. Order at Box8 Now. Box8 started off delivering yummy food in the year 2011. They are an on-demand online food delivery service. Currently, they deliver Indian food, wraps, and sandwiches all over Mumbai and Pune. This website is famous for its compact all-in-one meal box. They are known not only for the tastebut also for the packaging that makes it easier for you to consume food without any fuss at your workplace. It claims to sell over one lakh boxes a month. In addition to their online ordering, Box8 also has 22 physical stores in Mumbai. Box8 offers super-fast delivery; so make this as your top choice to order food when hungry. Whether it's a plate of hot steaming delicious biryani or salads that you’re craving for, now you can order them in just a snap with the technologically advanced Box8 services. Find your favorite food today through this Mumbai-based on-demand food delivery company. And ordering food has now become more pocket-friendly, thanks to the coupons and offers you can easily get online. We have a big list of Box8 offers here. Use these to save money on your food orders now! Their all-in-one compact meal box has been an instant hit with their customers and this concept has helped Box8 expand really fast. They serve food that they themselves love and their customers enjoy digging into. They have a wide range of options in their menu - giving a twist to sandwiches and wraps and the Indian fare as well. Opting for Box8 is the best way to have your meal at your workplace. But, did you ever think that ordering food would be this pocket-friendly? It is, with us. Order food from this service provider at low costs using the Box8 deals. We have an exclusive list of the best deals from this brand. Buy your meals with us, on GrabOn to get additional discounts as we have all Box8 coupon codes updated on this page. We have curated together all the great deals so that you can use these whenever ordering food from Box8. These coupons come for free and can be used anytime you want to. While some are for the new users, there are lots of others that are meant for all the users - new and old. You can now order food online every day without having to worry about your budget. We have you covered. The pocket pinch would be much less than usual if you use these promo codes and discounts. Variety of cuisines the likes of Indian, Continental and Asian and more are available on box 8. You name it and chances are that box 8 will deliver mouthwatering food right to your doorsteps, isn’t that awesome? And that’s not even the best part. You can save big on absolute lip-smacking snacks and meals with box 8 coupons. So, the next time you’re running low on cash and holding yourself back from a sumptuous meal, don't! All you need to do is head over to box8.in, choose your meal, place your orders and voila! Tasty food en route at amazing prices from the box 8 menu. The box 8 offers are valid on food items to purchase through box8.in throughout all major Indian cities, viz. box8 in Pune, box8 in Mumbai and box 8 Bangalore. For all you smartphone addicts, you can order from your mobile phones using the box8 app and enjoy awesome food delivered to you. You can save even more if you make the purchase using mobile wallets. While ordering food through Box8, Paytm seems to be a great choice. Similarly, whenever placing an order with Box8, Mobikwik should be looked up as well. Now enjoy tasty food at unbelievable prices and save more through Box8 Freecharge and other mobile and digital wallets. How To Use BOX8 Coupons On GrabOn? BOX8 is an online food delivery platform that offers lip-smacking food across all varieties and cuisines, from Indian all the way to continental. The delicacies are delivered right to your doorsteps. You can order food online and get it delivered under 38 minutes, all you need to do is - select your nearest outlet listed in their menu and place the order. Planning a party and in need of munchies? Worry not, BOX8 has you covered as they undertake all types of party orders. Unparalleled service along with on time delivery, helps all you foodies enjoy the fine dining experience online. Online ordering is available around Mumbai, Pune and Bangalore. If you’re bored of same old hogging routine, BOX8 also has sumptuous sides and beverages, such as ice tea, aamras, moong dal, chaas, halwa and much more.